SUMMARY: In complex regional pain syndrome (CRPS), functional imaging studies gave evidence for an important role of the central nervous system (CNS) in the pathogenesis of the disease. Especially, reorganization in central somatosensory and motor networks was demonstrated, leading to an altered central processing of tactile and nociceptive stimuli, as well as to an altered cerebral organization of movement. These findings may explain a number of clinical signs and symptoms occurring in the course of the disease and seem to be closely related to chronic pain in CRPS. Neurorehabilitative strategies, which target cortical areas and aim to restore impaired sensorimotor function in patients with CRPS, therefore, may be effective not only in restoring impaired function but also in pain reduction. This article reviews findings of functional imaging studies, which have been conducted to clarify CNS involvement in the course of CRPS. During the past few years, increasing evidence for the hypothesis of CRPS as a CNS disease has come from a number of studies involving functional imaging methods. With functional MR imaging (fMRI), single-photon emission CT (SPECT), and mapping techniques based on electroencephalography (EEG), magnetoencephalography (MEG), and transcranial magnetic stimulation (TMS), alterations of central somatosensory and motor processing have been detected mainly in patients with CRPS I. In this review, we give an overview of these findings of CNS involvement in patients with CRPS, focused on the central somatosensory and motor system, and discuss them with respect to possible therapeutic implications. In a pioneering study, Fukumoto et al in 199919 reported an alteration of contralateral thalamic perfusion in patients with CRPS I as revealed by iodine-123-labeled iodoamphetamine SPECT. This was the first functional imaging study providing evidence for an important role of the CNS in the pathogenesis of CRPS. This study was followed by a number of studies dealing with an altered central somatosensory network in CRPS. To examine possible alterations in the central processing of tactile stimuli, Juottonen et al20 used MEG to assess somatosensory-evoked fields in response to tactile stimulation applied to the tip of the thumb, the index finger, and the little finger in patients with CRPS I of the hand. They found a significantly stronger response in the contralateral primary somatosensory cortex (S1) and a nonsignificant tendency toward a stronger response in the contralateral secondary somatosensory cortex (S2) after stimulation of the index finger of the affected hand compared with the unaffected hand. In addition, the distance between the S1 representations of the thumb and little finger of the affected hand was significantly shorter compared with the representations of the thumb and little finger of the unaffected hand. However, an individual correlation between pain intensity and the amount of cortical alteration could not be established. These findings were interpreted with respect to an overlapping or smearing of cortical finger representations due to chronic noxious input or to simultaneous finger movements as a consequence of disturbed motor coordination. Similar overlapping or smeared cortical finger representation previously had been observed in patients with painful focal dystonia.21 This reorganization of the cortical finger representations in S1 might explain the phenomenon of referred sensations, which has been described in patients with CRPS.22,23 The results by Juottonen et al20 were reproduced in another MEG study conducted by Maihöfner et al, 24 who also observed an increased strength of magnetic fields and a reduced distance between thumb and little finger representation after tactile stimulation in S1 contralateral to the affected hand. However, the study of Maihöfner et al even extended these findings, showing a shift of the cortical S1 representation of the affected hand toward the lip representation and establishing a correlation between the amount of cortical reorganization and the intensity of CRPS pain and the extent of mechanical hyperalgesia. In contrast to the previous MEG study, Maihöfner et al used the McGill Pain Questionnaire to assess sensory, affective, and evaluative components of chronic pain,25 instead of rating acute pain alone, which was not related to cortical reorganization. Other clinical features such as motor and autonomic symptoms, including misuse of the affected hand, did not correlate with the amount of cortical reorganization, emphasizing the impact of pain and hyperalgesia for these cortical phenomena. However, given the fact that pain-related cortical reorganization was also observed in other chronic pain syndromes,26-29 Maihöfner et al concluded that the observed cortical reorganization in S1 might not be CRPS-specific but might explain the complex sensory features occurring in CRPS. Most interesting, Maihöfner et al30 conducted a follow-up study in their patients with CRPS in order to get information about the time course of S1 reorganization at least 1 year after therapy. They found a reversal of cortical reorganization coincident with clinical improvement. The only factor that predicted this reduction of cortical reorganization was the reduction of pain, putting additional emphasis on the relationship between S1 reorganization and chronic pain. Using a different methodologic approach, Pleger et al31 used EEG to localize dipole sources of somatosensory-evoked potentials (SEP) after electrical stimulation of the median and ulnar nerve in patients with CRPS I. Results were similar to the results observed in the MEG studies after tactile finger stimulation: After electrical stimulation of the median and ulnar nerve, they found a significantly smaller distance between dipole sources of the N20 SEP component, which are generated in area 3b of S1, after stimulation of the nerves at the affected hand compared with the unaffected hand. This indicated a smaller S1 representation of the CRPS-affected hand and probably a higher overlap of the cortical somatosensory representation of the median and ulnar nerve. Similar to the findings in the MEG studies, the amount of cortical reorganization significantly correlated with the degree of chronic CRPS pain but failed to correlate with current pain intensity or with the degree of immobilization. 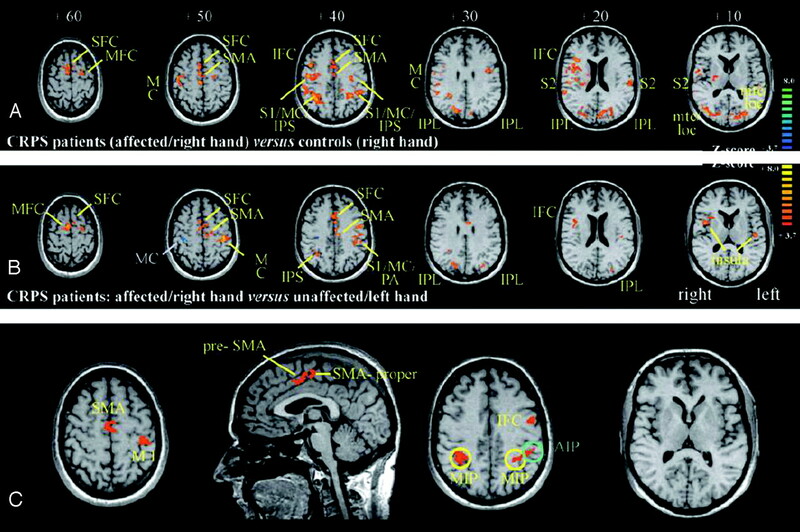 fMRI during electrical stimulation of the index finger was combined with assessment of 2-point-discrimination thresholds as a marker for tactile perception, to get more information about possible cortical reorganization not only in S1 but also in S2 and to assess possible perceptual consequences of S1 and S2 reorganization in patients with CRPS.32 In this study, cortical signals within S1 and S2 were significantly reduced contralateral to the CRPS-affected index finger compared with the ipsilateral side and with the representation in healthy controls. In addition, correlation analysis revealed a significant correlation between mean sustained pain intensity, 2-point-discrimination threshold, and reduction in signal-intensity strength in the contralateral S1 and S2 after stimulation of the CRPS-affected index finger (Fig 1). Hence, low pain levels were associated with small side-to-side differences, whereas patients with a distinctive hemispheric and discriminative asymmetry reported the highest pain levels. Again, neither reduced use nor current pain intensity significantly correlated with the cortical changes in S1 and S2. 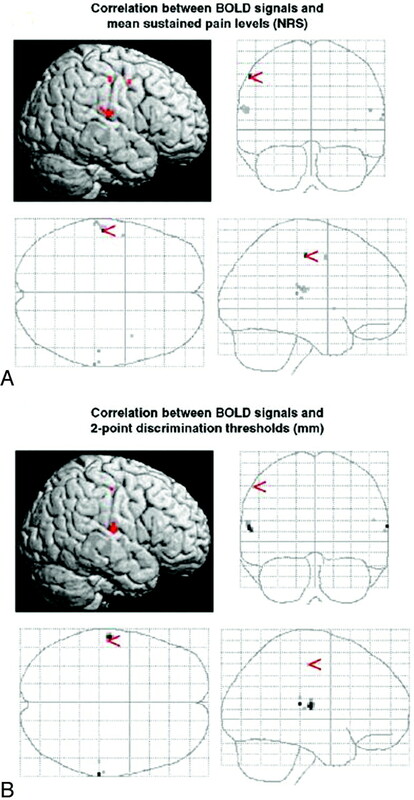 It was concluded that the observed changes in S2 might arise from a reduced forward propagation of inputs generated in corresponding S1 maps, given the fact that the activation level of S2 depends on either direct or indirect inputs from S1.33 Besides, this study demonstrated the functional relevance of cortical S1 and S2 reorganization with respect to the central processing of tactile stimuli. As a possible explanation, it was suggested that ongoing painful inputs might lead to an enhanced activation level of neurons responding to nociceptive inputs at the expense of neurons involved in tactile perception. In 6 of these patients with CRPS who were treated by antinociceptive drug therapy accompanied by a pain-adapted sensorimotor training program for 1–6 months, a follow-up study was conducted, and the time course of S1 and S2 activation after stimulation of the index finger was assessed by fMRI as well as pain intensity and 2-point-discrimination performance.34 The treatment led to a persistent decrease in pain intensity, which was accompanied by a restoration of the impaired tactile discrimination and an increase in cortical map size of the affected index finger in contralateral S1 and S2 (Fig 2). It was suggested that the rehabilitative training might strengthen sensory and proprioceptive feedback mechanisms that compete with nociceptive inputs and interact with relays of pain processing and cortical maps in contralateral S1 and S2. The above-mentioned studies were mainly designed to examine brain regions activated by either natural or electrical stimulation of fast-conduction Aβ fibers and, therefore, involved in the processing of tactile stimuli. In another study, Maihöfner et al35 used fMRI to examine the cortical network involved in the processing of pin-prick hyperalgesia in patients with CRPS I, because pin-pricking is known to activate Aδ fibers.36,37 Compared with nonpainful mechanical stimulation, during pin-prick hyperalgesia, there was a significantly increased activation of the S1 cortex contralaterally, S2 cortex bilaterally, insular cortex bilaterally, parietal association cortex (PA) contralaterally, inferior parietal lobule (IPL) bilaterally, superior, middle, and inferior frontal cortex bilaterally, and the anterior cingulate cortex bilaterally. It was concluded that the cortical network underlying pin-prick hyperalgesia comprises areas involved in nociceptive, motor, and attention processing, which might account for a number of clinical symptoms occurring in CRPS. Recently, fMRI was used to assess patterns of CNS activation following mechanical and thermal stimuli for the first time in children with CRPS of the lower limb.41 In contrast to adults, CRPS symptoms in pediatric patients often clinically resolve within several months to 2 years,42 which offered the possibility to study children during an active period of pain and after symptomatic recovery. During active pain, stimuli to the affected limb produced a greater level of positive blood oxygen level–dependent (BOLD) activations than stimuli to the unaffected limb, similar to the responses seen in adults,38 suggesting similar underlying pathophysiologic mechanisms. Most interesting, in the asymptomatic state, there were still significant differences in the CNS responses after stimulation of the affected and the unaffected limbs, especially involving regions in the frontal and parietal lobes, insula, and basal ganglia (ie, in regions involved in cognitive and affective function). However, the functional relevance of this finding (eg, with respect to pain processing) in later life remained unclear. Using TMS mapping of the motor cortex (MC) representation of the long extensor muscles of the fingers, Krause et al43 found a significant interhemispheric asymmetry between the MC representation of the affected and the unaffected hands with respect to the size, cumulative motor-evoked potentials amplitude, and volume of the motor output map.43 The MC representation corresponding to the unaffected hand was significantly larger compared with the representation corresponding to the affected hand. These findings resembled the representational asymmetries in S120,24,31,32 and might be explained by the close anatomic and functional relationship between MC and S1.44-47 The MC representational asymmetry was discussed with respect to chronic pain, though no direct relationship between the amount of interhemispheric asymmetry and pain intensity could be established. To assess possible alterations of the central motor system more closely, Maihöfner et al48 used fMRI to investigate cerebral activations during motor performance (finger tapping) in patients with CRPS I of the upper extremity. 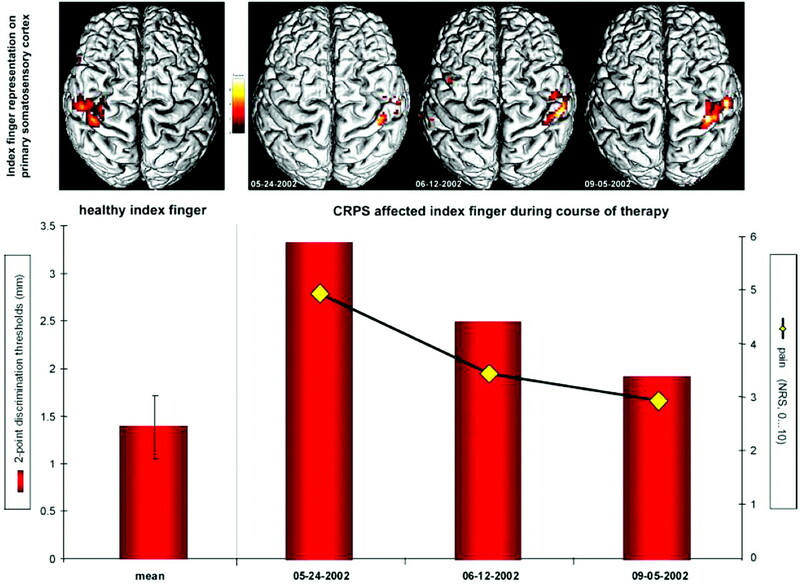 During finger tapping on the CRPS affected side, markedly larger brain activations were detected compared with those in healthy control subjects but also compared with the patient's unaffected side (Fig 3A, -B). The greater response during finger tapping on the CRPS-affected side involved the classic motor areas (MC), supplementary motor cortices (SMA), and intraparietal sulci (IPS) bilaterally, but also the bilateral S1, S2, IPL, and the superior frontal cortices as well as the ipsilateral middle and inferior frontal cortices. In addition, the individual degree of motor impairment as assessed by the individual tapping frequencies, significantly correlated with contralateral MC and bilateral SMA activations but also with bilateral activity in the medial area and left hemispheric activity in the anterior area of IPS, as well as with activity within the contralateral inferior frontal cortex (Fig 3C). The larger brain activation during finger tapping in CRPS was discussed with respect to defective inhibitory mechanisms at the level of the MC, which already had been demonstrated in patients with CRPS I by using MEG and paired-pulse TMS in previous studies.18,20,49,50 The authors concluded that substantial adaptive changes within the CNS might contribute to motor symptoms in CRPS. Whereas patients with CRPS with dystonia were excluded in the study by Maihöfner et al48 to achieve a homogeneous patient group, patients with CRPS I with dystonia were explicitly examined by fMRI in a recent study by Gieteling et al.51 The distribution of cerebral activations was assessed during both motor execution and imaging of movement of affected as well as unaffected limbs and compared with the activation pattern in healthy controls. There were no differences between patients and controls when they executed movements or when they imagined moving their unaffected hand. In contrast, compared with controls, imagined movement of the affected hand in patients with CRPS led to less activation in the ipsilateral prefrontal and premotor cortices and the anterior part of the insular cortex. In the contralateral hemisphere, the postcentral gyrus and the inferior parietal cortex were less activated. The authors concluded that patients with CRPS I and dystonia displayed areas with decreased activation during imaging of movements that are involved in planning of movement, multimodal sensorimotor integration, autonomic function, and pain. It was suggested that chronic pain might alter the cerebral organization of movement by functional interaction between these regions, which might explain the occurrence of motor symptoms like dystonia in CRPS. During the last decade, functional imaging studies provided increasing evidence for an important role of the CNS in the pathogenesis of CRPS. Especially, reorganization in central somatosensory and motor networks was demonstrated, leading to an altered central processing of tactile and nociceptive stimuli, as well as to an altered cerebral organization of movement. In a number of studies, typical clinical CRPS symptoms could be directly linked to this CNS reorganization, such as impaired tactile perception (hypoesthesia) in the absence of peripheral nerve lesions, dystonia, or reduced finger-tapping frequency as a marker of motor impairment.32,48,51 Many studies provided evidence for a close relationship between chronic pain and CNS reorganization in somatosensory and motor networks in CRPS. It can be hypothesized that persistent nociceptive CNS inputs, probably due to peripheral mechanisms such as neurogenic inflammation, interfere with central networks of tactile perception and motor control, therefore inducing plastic changes in these networks. An alternative but not mutually exclusive hypothesis is that the disturbance of cortical representations of movement and tactile perception itself promotes pain perception, being at least in part cause and not only consequence of chronic pain in patients with CRPS. The latter hypothesis is supported by the fact that neurorehabilitative strategies, which target cortical areas and aim to restore impaired sensorimotor function in patients with CRPS, have proved to be effective not only in restoring impaired function, but also in pain reduction.52,53 Again functional imaging techniques might be a useful tool to accompany such therapy studies,34 to help in developing optimized therapies to restore the alterations occurring in somatosensory and motor network in patients with CRPS.